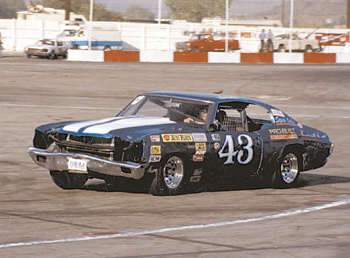 Even if you never sat in Saugus' always newly-whitewashed grandstands, the Saugus Speedway Scrapbook will make you feel as though you were there through fifteen years of some of the best and brightest in California paved short track racing history. If you actually were in the stands or, better yet, on the track, this beautifully conceived and thoughtfully laid out book is part of you, something that finally articulates what you've been trying to explain to a lot of people for a long time now since Saugus' property owners capriciously closed its gates on that fateful July 19th in 1995, with half a season left to race. This book cannot bind those wounds, but it will make it easier for others to understand how deeply they hurt. This book does not preach nor has a moral, but the story that it tells (almost exclusively with photos) is simultaneously a romance, an action-adventure, and an extended family album, all wrapped up into one totally engrossing volume. 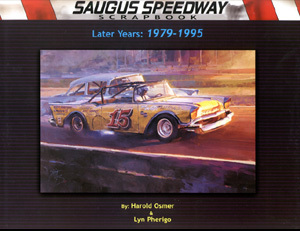 The book's dedication: "…To the drivers, officials, and fans who were too busy being part of the Saugus Speedway family to complete their own scrapbooks" is flat perfect. When you get your copy try to page though it with someone who frequented Saugus … They'll provide the best text that anyone could. This book is a "firestarter" in that respect, a sparking device for a flash fire of wonderful remembrances. In this case a picture can be the launch point for a thousand words, or more. The authors, Harold Osmer and Lyn Pherigo, toss off their Herculean labors in putting the book together by naming this important work of motorsports history a "Scrapbook". In reality this formidable team has used the word in its very best sense. Wound tight with wonderful memories and fat with future promise, (see how many top stars of today you recognize as fuzzy-cheeked youths learning their trade at Saugus), this book will be a welcome addition to any short track fan's library. 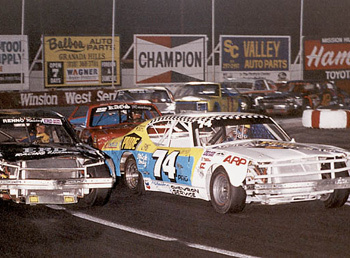 Other tracks, great and small, should have the kind of great good luck that Saugus Speedway has had with this duo in its wake to preserve, protect, and celebrate its history.